After a 30-year career as a solicitor with a large international firm, I was ready for a complete change. I had always appreciated the natural beauty of wood and the craftsmanship involved in the making of fine furniture; so (after attending a couple of short courses to test my enthusiasm) this is what I decided to pursue. Fortunately my wife Penny was immensely supportive. Our children were all but grown up and we both felt that the time was right for a new chapter in our lives. I built a workshop in our garden in the heart of the Surrey Hills and equipped it with a full range of woodworking tools and machinery. 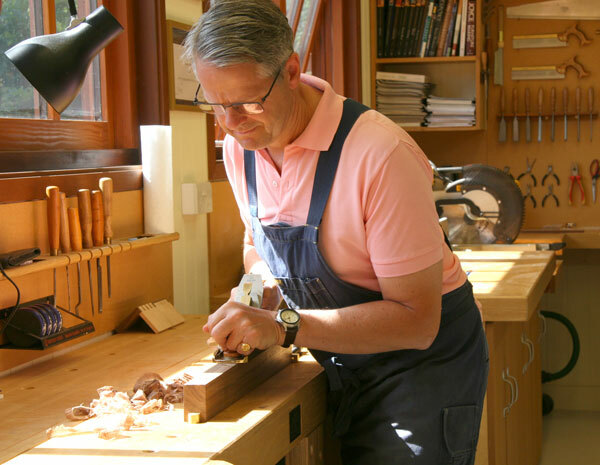 I attended a one-year course on furniture making with John Lloyd in Sussex. This was followed by a further three-month course with John on furniture restoration. The time spent with John was a revelation. He managed to convey his immense knowledge and experience with patience, encouragement and endless good humour. With John I learnt the importance of precision and attention to detail. I also began to develop my own thoughts on form and function when it comes to design.